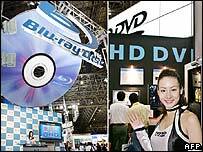 The backers of the Blu-ray high definition DVD system are predicting victory in the format wars with HD DVD. The two rival camps have divided consumers since the two incompatible systems were launched. 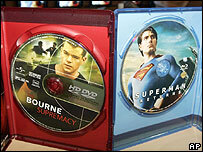 But Blu-ray supporters are touting the decision by Warner Bros to shift allegiance as a tipping point. Andy Parsons, of the Blu-ray Disc Association, said: "It's much clearer to consumers now which of the formats is going to prevail." Speaking at the Consumer Electronics Show, in Las Vegas, he added: "We still have a little bit more work to do before we can say the format war is over." Howard Stringer, chief executive of Sony, the creators of Blu-ray, was also unwilling to declare outright victory. "I never put up banners that say 'Mission Accomplished'," he said. In North America, films on Blu-ray disc are outselling those on HD DVD by more than two to one. No-one from the HD DVD promotion group was available for comment after the organisation cancelled all press interviews at the show. "Nobody likes a format war - it's not fun, it's very time consuming and it confuses consumers," said Mr Parsons. The battle between HD DVD and Blu-ray has echoes of the rivalry between Betamax and VHS in the 1980s. The cheaper format, VHS, prevailed while 20 years on it seems as though Blu-ray, the more expensive system, is winning the race. David Bishop, president of Sony Pictures Entertainment, said the Warners' decision was "a great message for consumers". Mr Bishop said the Blu-ray camp would welcome any move by Universal and Paramount to shift formats. "We'd love to have them over and hopefully they will in the short term so we can act as a single industry." Sony has been talking to retailers about the possibility of helping HD DVD owners who now wanted to move to Blu-ray. "We haven't had any meaningful dialogue as yet. But it is something we have considered." Kevin Tsujihara, president of Warner Bros Home Entertainment Group, said the decision to back Blu-ray exclusively had been driven by consumers. He said sales of the studio's movies on Blu-ray were outselling the same title on HD DVD by three to one. He said that a disc unveiled by Warner last year at CES which could hold both formats had been dropped because none of the other studios would support it. "As a result retailers would not stock it," he said.